The government was shut down, and I found myself racing up by Canada, perhaps in a desperate attempt to flee the country. 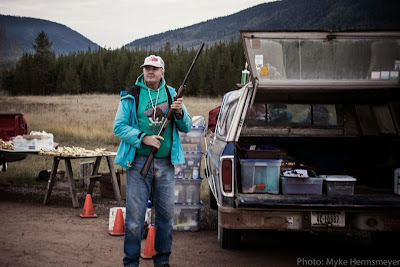 I spent the night before the race in Whitefish, Montana, known to some as ‘Canada’s Tijuana’. It’s where Canadians go for their bachelor parties, and one of the founders of Google has been buying up businesses around there, targeting joints that can easily be converted into a hairy, wild, bearded Canada party, with probably at least two Red Sox worthy beards. 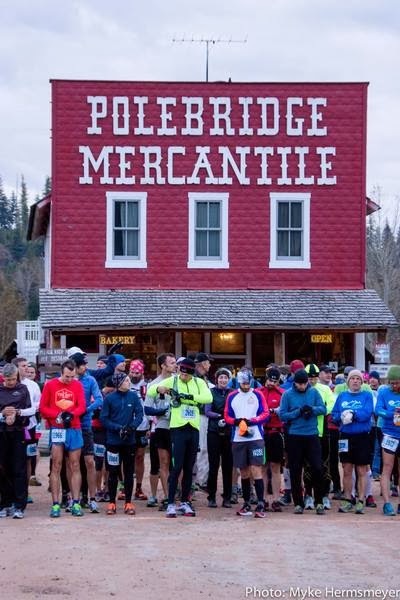 The race started and ended at Polebridge’s Mercantile store, which has really good, fresh 50 cent cookies (and brownies, amazing brownies too). We were 40 miles from the nearest gas station, and the dirt road heading to Canada seemed more remote than some Boy Scout camping trips. It reminded me a bit of Red’s Meadow in the Sierra Nevada, a kind of remote outpost in the midst of a National Forest, in a valley surrounded by mountains. Prior to the start, I was able to use an actual outhouse for the prerace dump, which I believe was key in avoiding digestion issues (I use whatever superstition I can get). It also somehow made me feel more Canadian, and I began humming Neil Young’s ‘After the Goldrush,’ and wondered what it must be like living in a country with great taste in music (except Bieber—I don’t know what happened with him). By the time the shot went off, I was cold, so I went out like a man—way too fast! I was a fugitive, gaining distance on a pack of pursuers as I high-tailed it towards Canada, maybe to Waterton. I may have passed an aid station without knowing, but it turns out the first manned aid station was nearly 20 miles in. This didn’t matter much, however, since my friend Myke was crewing me in a car (thank you!). A car, by the way, is the best pacer ever—they can drive back and forth, give splits, take pictures, and hold enough gel products to bathe in. High-tailing it to Canada. Credit: Myke Hermsmeyer. The course was 50 miles, flat-ish and non-technical. I found myself going at a strong pace all the way to the Canadian border at mile 28, but once the course dipped back south I started to slow (ugh, America … ). I had seen the land with a functioning government, and, despite my competitive drive, must have felt reluctant to turn around. So I dipped from 1st place to 6th, thanks to our government. I don’t blame Canada. A beautiful course! Credit: Myke Hermsmeyer. Caught by the steam train behind me. Credit: Myke Hermsmeyer. Eventual winner Andy Prevost taking the lead at the border. Credit: Myke Hermsmeyer. Slipping in under seven hours. Credit: Myke Hermsmeyer. Though this was a flatter course than the original, it’s unclear whether it’s easier. Eight people went under seven hours (there’s never been more than four prior), but, though there were two people who had gone under 6:05 last year, neither went under 6:20 on this course. Montana award ceremonies are cool. For the most part, there’s no award inflation (like having the overall winner taken out of age division awards, having small age divisions, etc. ), and the awards are few. Some races, like Devil’s Backbone, have no award ceremony but a post-race breakfast instead, to share stories and travails of the race. Awards are nice, but it’s great to see a culture that doesn’t give out awards easily, and recognizes that the experience is the prize. Le Grizz only gives awards to the overall winner of men’s and women’s open, master’s and senior’s divisions (20-39, 40-49, and 50+). This race also recognizes wit, with this year’s “Government Shutdown” award going to the best remark about the whole mess. The winning quip was, “If a tree falls in a forest, and a politician hears it, he will blame someone”. Flat races are difficult, and hills are my friends. Why? Because a 100% runnable 50 miles is tiring, and switching to power hike mode gives a mental and physical break. It’s why so many Americans are addicted to TV. Commercial breaks give our attention a chance to recharge and become fully invested in Daryl Dixon’s crossbow skills, or Walter White’s transformation into horribly awesome. Flat races are not for the attention deficit. I may have had a better finish if I'd stuck with the pack of five behind me. By twenty miles in, I was several minutes ahead (and by 30 miles in, several minutes behind), which should have been a warning sign that I was taking it too fast. Still, dealing with the mental pressure of leading a race was valuable. Leading is scary, and I look forward to not doing it again anytime soon. Canada … I should have gone to Canada, I should have gone to Canada.